The Holiday Buffet Champagne Brunch is now offered on Easter and Mother's Day and select holidays. Monday through Friday from 11am - 4:00pm for lunch, 5:00pm - 10:00pm for dinner. Saturdays 5:00pm - 10:00pm for dinner. Holiday Brunch 10:00am - 2:30pm, 4:00pm - 9:00pm for dinner. The Drying Shed a full service restaurant that also specializes in catering banquets both large and small. Our food is prepared on premises to ensure quality. Our casually elegant banquet rooms are equipped to service your Wedding Reception, Rehearsal Dinner, Holiday Party, Retirement Dinner, Baptismal Brunch, Business Luncheon or any other type of function you may be planning. Lunch Monday through Friday from 11am to 4:00 pm. Dinner Nightly from 5:00pm. There is ample free parking. Reservations are Welcome. Please note: Prices are subject to change; verify accuracy in house. I would be happy to meet with you personally to assist in all your party plans. * It was great!! Only a few tables were being served when we were seated because it was still pretty early, but we were free to help ourselves with their elaborate display of food!! HOLY MOLY!! They have SOOOO soo much stuff here!! * My rib-eye was moist and juicy with so much flavor that I drooled a bit and I used a piece of bread to catch it from my lip and ate it!! The prime rib was even more I mean absol-freaking good that I hesitated on mine and was about do a plate swap. The roast was baked to perfection and her cut was extreme hearty. * Still loving the Drying Shed! My guy and I decided to try the champagne brunch for Father's Day and we loved it! We were seated immediately since there were only 3 of us-which was nice! I was stoked to see the spread! * I've been here three times now since discovering the place two months ago. I've had the New York steak, prime rib, and filet mignon hamburger, and all three were delicious. * Just left The Drying Shed. The lounge was comfortable to have a cocktail while we waited for food to go. Ordered three sirloin / filet mignon burgers that came with seasoned steak fries ... they were excellent. Also ordered the Eastern Scallops dinner came with baked potato and steamed vegetables, fabulous! The scallops were melt in my mouth, so succulent. 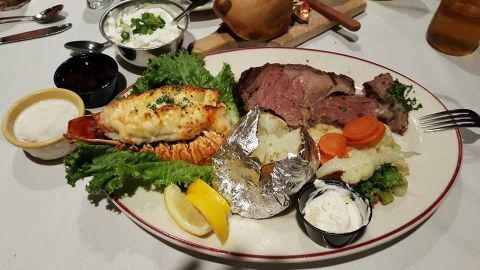 We are looking forward to inhouse dining next time to try the prime rib dinner Tuesday special. We really like the place and atmosphere. * After eating at this restaurant a few times, and for visiting the bar for other reasons, I am now a HUGE fan of this place. The meat is seriously the best you can find! I HIGHLY recommend this place if you like filet mignon.